It’s Wilt Chamberlain and Frank Selvy. Then there’s Selvy. 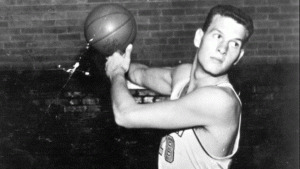 The Furman basketball star holds the record for most points in a game at the Division I level, when he scored 100 against Newberry on Feb. 13, 1954. Selvy’s impressive college career wasn’t held to only that night. The Paladins legend was the first player in NCAA history to total 1,000 points in a career — and he was the first to average more than 40 points per game. The two-time Southern Conference player of the year, Selvy totaled 2,538 points in his career. He remains the program’s all-time scoring leader. Selvy later was the No. 1 overall pick in the 1954 NBA Draft, going to the Baltimore Bullets. He played nine seasons in the NBA, though he also served in the U.S. Army and missed the 1956-57 season. He also was Furman’s head coach from the 1966-67 through the 1969-70 seasons.